It is normal for men to have breast gland tissue. Growth of this breast tissue to give a more feminine shape can be normal during puberty and is usually self-limiting. Overgrowth can also occur during hormonal changes, weight changes and with the use of some drugs and medications. If this overgrowth persists it can cause social embarrassment. Surgical removal is an option. Before surgery, many of my patients avoided removing their tops at the beach but felt comfortable to do so afterwards. Mr Davis does not operate for very minor cases of gynaecomastia but is happy to recommend other local surgeons. He continues to do cases with significant deformity. 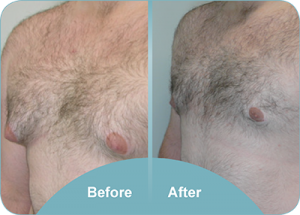 How much does gynaecomastia correction cost? Some cases can be treated with liposuction alone. Others require an incision around the areolae and excision of tissue. The cost depends on which technique is used and a consultation is needed to determine this. For a range of the current fixed costs please either email us or phone us on 0800 268 526.. The quoted cost for surgery covers everything including anaesthetist fees, theatre fees, consumables, the implants, staying overnight in hospital after surgery, any additional consultations after the first consultation and all the follow up for dressings and checks in the first year after surgery. This cost includes GST. The most common causes are a mismatch between the level of male and female hormones. This is most likely around puberty and during male menopause. Large weight gains are another common cause. Certain medications and the use of recreational drugs including marijuana and steroids in body builders will also cause breast tissue growth. Liver disease and testicular tumours (which release hormones) are a less common cause. It is important to rule out the use of background medication and drug use that can cause recurrence of the overgrowth. Hormone treatment in new cases may be effective before the breast tissue becomes too fibrous. Weight control in cases of obesity is important. At a quick glance there will be a significant improvement in breast contour with a more masculine appearance. Subtle asymmetry both before and after surgery is very common and normal. Minor surface irregularities are possible but should be subtle. Under general anaesthetic, liposuction of the breast gland and surrounding tissues is performed. If there is still a residual nubbin of fibrous breast tissue that cannot be removed by liposuction, this is excised using a semicircular incision around the lower areola. A compression garment is then placed. You are able to shower normally the next day wearing the garment which needs to be worn for 3-6 weeks depending on the extent of liposuction. Is all breast tissue removed? The breast is formed by the breast gland and a layer of fat over this. It sits on the pectoralis muscle. It is important not to remove too much tissue otherwise a hollow and unnatural shape can be created which is more noticeable than a slight prominence. Does skin need to be removed? In most cases the skin will contract back down after the underlying breast tissue is removed. However in very large breasts or in cases of massive weight loss it will be necessary to remove breast skin. This will leave a scar on the breast, which is a trade off to give the best contour. The scar is orientated to be as inconspicuous as possible. How long does swelling last for? Approximately 90% of swelling is gone by two weeks after surgery but it often takes six months for all swelling to go and the final shape to take effect. What are the main risks of gynaecomastia surgery? Unrealistic expectations about the surgical result. The great majority of people are extremely happy with the surgical result, have a greater self esteem, are less embarrassed of their chest in social situations and have a better quality of life.